Edward is my first child, my February baby; so sweet from the very beginning. He knocked on my door at exactly midnight of the eleventh of February 2008. I both hoped and knew in the deepest part of my heart that the eleventh would be our day. Brand new sheets were on the bed, cucumbers were in the fridge for my husband to munch on for when I didn’t cook and I slipped into my laboring night gown (long, very soft cotton full of buttons so it was easy to bring my baby to my chest at delivery). I climbed into bed, it was Sunday, the day my husband and I say our wedding vows to one another. We recited our vows, had a swift kiss and snuggled in for the night, exited to see what the next day would bring. About five seconds later, my water broke. I rushed to the bathroom so the sheets would not be wet. Towel, undees and back in bed to diligently and militantly relax through my birth breathing. HeHe. Surges, breathing, surges, and breathing. I decide to get in the tub at around 2. It took 45 minutes for me to become comfortable enough to not even know when the surges were happening. So after a quick call to April (who advised me to try and relax) I decided I didn’t want to be comfortable any more. I wanted a baby, and got out of the tub. The bed turned out not to work, but walking was wonderful. Dancing with Bachir and humming took up the next 2 hours. My walking gradually turned to running, my dancing turned to dangling, and my humming turned to light moans, ‘ol’ man river’ style. A quick trip to the toilet was next. The surges were really coming, and I broke the towel bar on my way down to the floor to relax. (This is one of my favorite parts of the story.) All that hypnobirthing practice really came in handy I think, because even though the surged were really coming I was never for a moment stressed out, or worried or anything. In fact, until like 30 minutes before I delivered I would not have believed that I was as far along as I was. Sherry put me on my hands and knees to relieve some pressure on my back, Bachir laid on the floor in front of me so I could rest my head on his middle in between surges, and my sister was awakened to work on counter pressure (in my lower back). April, who was trying to get to us like a mad woman was stuck in her neighborhood by some huge rocks that had fallen (another favorite bit of my story). So everybody was pleading his or her case to the construction authorities to be the first to leave the neighborhood. I think she won. J And about 20 minutes, I guess, before our son was born, April breezed in our bedroom. She was almost silent in her work, but calm and commanding in her energy and voice. I felt even safer. She worked with Sherry, rooting through the birth box Sherry had opened minutes earlier, and coached me through the final breaths of my delivery. I’d like to say I was obedient to Sherry and breathed through my surges, but I can not. By the time April knelt down on the floor just outside my master bathroom, I was already crowning. Bing bang boom, Edward was born, passed through my legs and into my arms, wrapped in a towel that my sister fetched from the linen closet just then. He was so perfect; he didn’t cry, just snorted a little bit and kept his hands on his cheeks. Just like I imagined him in my womb. 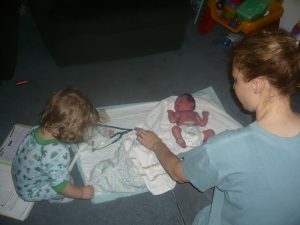 I never thought I would’ve been pleased to have the umbilical cord cut so soon after birth, but I needed to hand Edward to someone, I was a little tired all of the sudden. Sherry had told me my legs were purple like 20 minutes earlier and I was beginning to believe her now. Bachir help his son for the first time, April and Sherry took care of me, and by 7:30 am I was back in bed; in my brand new sheets with my son and husband. He was the best of all the rest, and still is: My sweet little boy. Most people who find out that I had a home birth, with my first child no less tell me I am brave. But after delivering the most perfect little person, in the most perfect place, with the best midwife and doula, husband and sister around me, I know that I had to brave nothing. It was easeful and peaceful and enjoyable. He knocked on my door, and came into my life just exactly as he saw fit. And I couldn’t possibly ask for more or different. It was perfect. My little girl, my precious second born angel, broke all my preconceptions when she knocked on my door. She was teaching me then not to put any expectations on her. And why would I be surprised after all. She was full of spirit and joy from the very moment I sensed her in my womb. Genevieve in some respects came to me so peacefully, so gently. My water broke in the middle of the day on Wednesday, and I got to meet her finally on Saturday morning. The process was slow, and felt like a lifetime. She was well worth the wait! So from Wednesday to Saturday I followed (sometimes faithlessly) the wisdom of my daughter and waited. Every night April would come to my house for a check or consolation and say reassuringly, “ I think we’ll have a baby tonight.” And every night I’d rock my little boy to sleep all misty-eyed, with the belief that it would be the last time I would hold just one baby. We walked, we rested, we meditated, we waited, we went down to the strip, and we walked some more. It was almost the exact opposite of my labor with Edward. But my little girl was always present with me, she hiccuped and played and had a wonderful time those last few days. In fact only after I gave birth and my water broke again did we realize that the tear in the placenta which had make my waters go the first time had healed up and she was perfectly safe and sound in there. April couldn’t even find a whole in the placenta. She said Gigi might have scratched it during her play. What a sweetheart! A little Cohosh from April got the show going, and I was rocking and rolling with surges all Friday night. The hours were long but the surges were relatively gentle. As I said before she came peacefully. But I was getting tired. We called Sherry, and as she rocked in our recliner, I crawled on the floor a little bit trying to work on the pressure. I only felt it in my back which kind of made me feel like I was sailing without a compass. I could not feel how much of my uterus was engaging, I had no need to “breath up” with the surges. It was only in my back and it was low. April came in one of the wee hours of the morning in the most comfortable out fit I have ever seen. (She said she had laid it out especially for my birth. Thoughtful lady) by this time, having them both there to reassure me was wonderful. I remember hearing, “you can do this, Liesle” “you are doing great”. As I sat on the downstairs toilette backwards screaming my frustration into a very squishy pillow I felt warm peppermint oil being pressed into my shoulders and down my arms, and the strong touch of fingers running down my back, coaxing my baby’s head downward. The sun was beginning to rise now, bits of light were coming in through my downstairs windows. Then, I heard a sound, a light trickle. Sherry and April gave me a firm assurance that we needed to get back to the living room floor right then. I was too busy thinking this baby would never come to realize they were telling me it was go time. A couple more firm reassurances that we COULD NOT stay in the bathroom got me to rise and find in the living room chux on the floor and a chux covered sofa. It felt like Christmas morning! While I was busy with something else, a loving person had come into my living room and left me a sweet present. It made me smile, but I’m pretty sure it was only on the inside. Once I was seated on the floor with my back to the couch, in unison Sherry and April instructed me to put my hands on my knees. Bracing myself for another 12 hours of labor and pushing (I was very mellow-dramatic) I allowed one “stinky” surge, as Sherry called it (a surge that’s hard after a move). After that I switched into high gear and pushed with all my might. And that was all it took. My little girl came so fast Bachir didn’t even have time to catch her. No one had time to catch her. Her teeny little frame was scooped up by April immediately and was placed on my belly. She was the most amazing, beautiful, noisy little thing I had ever seen. I loved every inch of her. It took her a couple minutes to calm down, and once she did she opened her enormous eyes and took a look at her mom and dad, then had a long satisfying breakfast. She was born the exact way that suited her needs and desires and the way that respected the wisdom she wished to bring the world. What a blessing she is to us! The timing was perfect that morning. Genevieve was born, she bonded, she cuddled, and she ate, had a quick bath and some snuggly time before her big brother woke up and came downstairs. It looked like his Christmas morning as well! During the night someone had left him a sweet surprise. 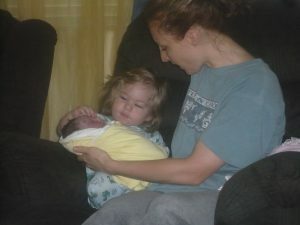 Seeing there first tender moments together in our own home was priceless to me. Every time I see that day in a photograph I have in my kitchen I am once again grateful to be able to birth my children at home. It’s where our family begins. That morning was full of wonderment for me. The emotion was so sweet and so deep. Once again, I had delivered the most beautiful baby, in the best place I know, with the best husband, midwife and doula. I can’t imagine ever topping that.